Beauty supplements are the perfect combination of internal and external health. Not only can they nourish your body, but they can also make your skin glow, your hair shine, and your nails strong. (We have a soft spot for the Beauty Chef's Glow Advanced Inner Beauty Powder $70). The newest supplement to hit the market comes from Goop—the health and wellness website created by Gwyneth Paltrow. 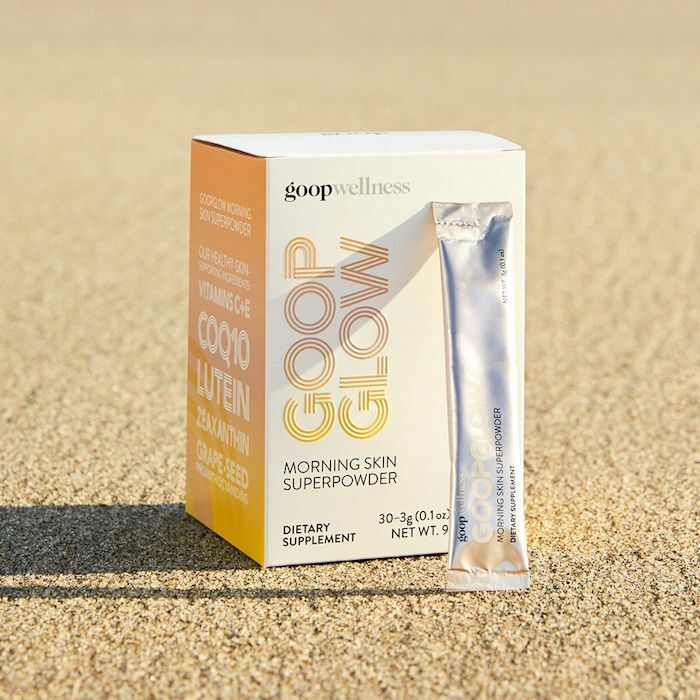 The supplement, called GoopGlow, was just released today, and it has already created a lot of buzz since it's the first skincare supplement that the brand has ever released. The supplement is a powder that comes wrapped in individual packets. It's a blend of six powerful antioxidants (vitamin C, vitamin E, CoQ10, lutein, zeaxanthin, and grape-seed proanthocyanidins) meant to halt the effects of toxins, pollutants, and stress on your skin. It promises to stop fine lines and wrinkles, sagging, uneven skin tone, and other signs of aging. As if that's enough, the product also promises increased photo protection, or sun protection, and collagen production. All you have to do is mix the all-natural orange powder with water (so it also encourages hydration). It's dairy-, gluten-, soy-, and sugar-free, but it tastes like "orange lemon verbena," thanks to natural orange and citrus essential oils. It sounds kind of amazing, right? We'll be trying this out for ourselves ASAP. Next, see the collagen creamer that turns your morning latte into a beauty supplement.